So, here's the game. 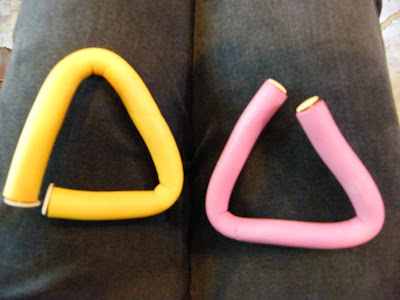 Take these two hair clips triangles and make four triangles out of them. "Can't be that easy, can it?" I thought. If it is a Bucky Session and you are dealing with triangles, it can only asking for a tetrahedron. "Hmmm... let me try something else..."
So, I got this. Four triangles out of two. Ha ha! Joo Hock said that this is one of the possible solutions, but I can certainly think of a more elegant one! Cheeky! OK, I concede to it. Here's your tetrahedron. From two triangles you get four triangles. 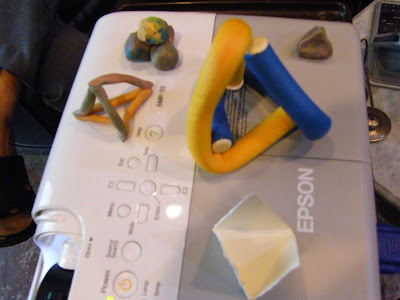 Next, he gave me a few lumps of plasticine to form a tetrahedron. This time, I am clever and choose the easiest way out. I got this! And it is correct. The moral of the story here is to choose the easiest answer to the question. 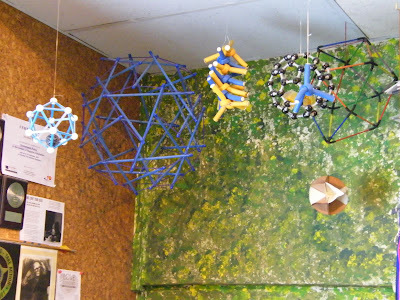 Here are the various tetrahedrans we made. 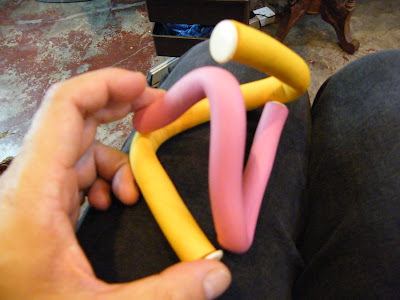 The one made of four balls of plasticines is expressed by 'events of energy''; the one with thin lines expressed as 'relationships'; and lastly, the one made of paper is expressed from planes. The objective of this exercise is to make you look at problems from a different perspective, or thinking at it 'out of the box'. Often, people make assumptions subconsciously that restrict their view of the world. For instance, one may assume that the solution is one that is two dimensional (planar), instead of three-dimensional (like the tetrahedran). I assumed that the solution cannot be that 'obvious', ie. a game got to be 'difficult', not easy. 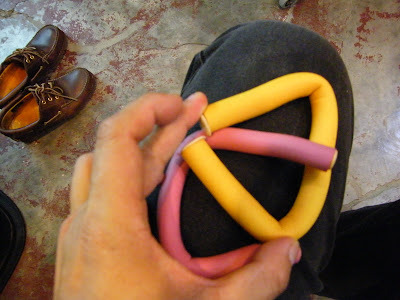 Hence my four convoluted two dimensional triangles with the two hair clips. Thankfully, the Bucky Group comprises people from different backgrounds in terms of: age, religion, race, gender, nationality, cultures, languages, formal educational level, profession, talent, hobbies, exposures to different parts of the world, ... etc. Hence we get different perspectives to every topic we discussed. In many groups and organisations, alternative views (perspectives) are often gunned down. In the Bucky Group, we allow different opinions and views to be expressed. Sometimes, we don't agree with each other but live with the disagreements. Sometimes, we even get to understand more about something because of the disagreements. Isn't it beautiful? Clara shared her experience that as a mother of an autistic child, she has learned to assume that her child cannot do anything on his own, and everything has to be trained. Interestingly, it is because of bringing her expectations to 'zero' that she began to look at many things from a new and different perspective. Often, engineers are so deep into the technicalities of a problem that they fail to see the broader perspectives of the problem. The Chairman of Las Vegas Sands, Mr Sheldon Adelson, when asked what his secret for success is, commented that he identifies a business opportunity whenever someone who has been in the industry for a long time insists that the business in question cannot be done in any other way, because 'that's the way it has always been'. When he hears that, he goes in with his own way and succeed. Similarly, I went into the information technology industry after the many complaints I heared from fellow students moaning in the computer labs about how much they hated programming. I saw that that as an opportunity, and that there must be an easy way to programming that the other students had not discovered, and there was, as I later discovered to my delight. From there, I lead an exciting and successful twenty year career in the industry in seventeen cities across four continents. I think 'engineering' can be a mental hazard, though it is a great discipline and is a subject of an honourable profession. 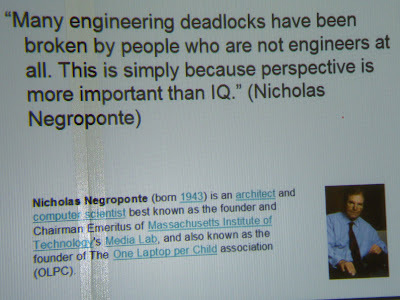 I am saying this as an engineer myself. It is very important that engineers get into the depths of engineering, but also remember to get out of their tunnel back into the needs of the real world. An amusing story, but not quite appropriate because the Alien does not know the rules of golf. Therefore the Alien looked at the game that way due to his lack of knowledge and not that he has a different perspective. A 'game', by definition, is a series on decisions and actions/responses, based on a finite set of rules. Joo Hock summed up by saying that the exercise is to encourage us to look at problems with a new perspective and what we have covered today is only a superficial view of Bucky's geometry. Further, we will drill into the deeper meanings of such geometry, and we will also do so in our Sunday sessions at MacRitchie. 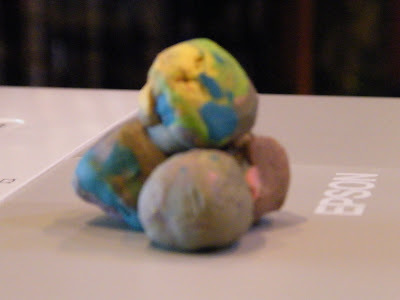 *Hint* Tetrahedran are very useful to express multi-dimensions. Why? Here are some more of the Bucky artifacts. 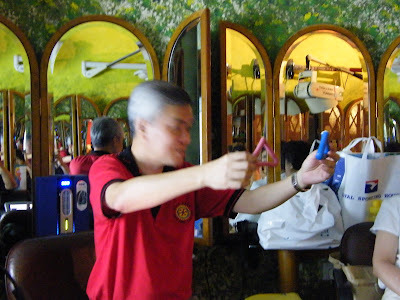 Joo Hock hangs them in his cozy corner in his salon. We will come to that someday.